I am really excited to be one of the blogs participating in the ‘Book Lovers Holiday Giveaway Hop’ hosted by I Am A Reader Not A Writer and Co-hosted by Maryann from Chapter by Chapter. 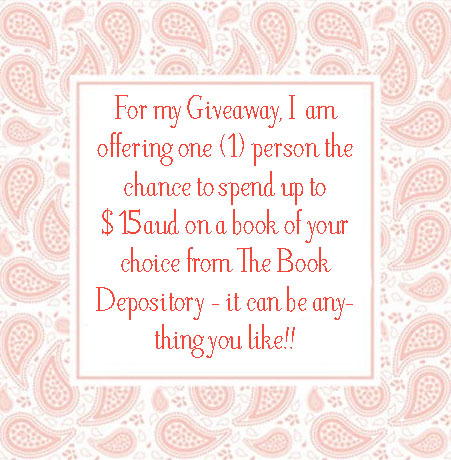 As a huge fan of everything book related, I have decided to make my giveaway for a book of your choice; there are so many amazing releases for 2013 so pre-orders are also accepted (if TBD has it listed). All you need to do is fill out the Rafflecopter form below. This hop will run from the 4th through to the 10th December 2012. 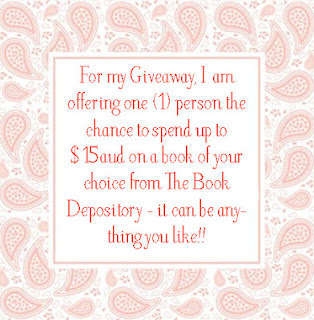 Rules: Giveaway commences on the 4th December and ends on 10th December 2012 and is open Internationally as long as Book Depository ships to you. All you have to do to enter is be a GFC follower of my blog. The winner will be picked using Random.org and emailed on December 12th. The book will be shipped from the Book Depository - no responsibility will be taken for misplaced/lost items. The best book I've read this year was Fair Game by Patricia Briggs. The best book I read this year has to be The Evolution of Mara Dyer. I loved it! I loved The False Prince - looking forward to the next book, Runaway King! Thanks for the giveaway! The best books I read in 2012 are The Lady is a Vamp by Lynsay Sands, The Golden Lily by Richelle Mead, Once Burned by Jeaniene Frost & Defiance by Shelly Crane. I loved The Fault in Our Stars and Angelfall! I really liked Cinder, and the first volume of the Paradise Kiss manga. I think the best book I have read for this year is The Alchemist by Paulo Coelho. Before I Wake by Rachel Vincent and Insurgent by Veronica Roth!! I would say The Opportunist by Tarryn Fisher. I also liked Shadow and Bone, Night Beach, The Storyteller, Drowning Instinct and Speechless. I have read some, and Insurgent for me was the best. Grave Mercy :) thanks for the giveaway! Leviathan by Scott Westerfeld. I loved it! Insurgent, The Mark of Athena, Rise of Nine, etc.. I do have 3 books on the way from TBD. Just got back into reading now. Game of Thrones by George RR Martin. My favorite book this year was Slammed by Colleen Hoover! So many great ones. My favorite was On the Island. The best book I've read would be Clockwork Prince by Cassandra Clare...Thanks! Drowning Instinct by Ilsa J. Bick. I read it in January and I still can't stop thinking about it! The Fault in Our Stars by John Green and The Sea of Tranquility by Katja Millay. Both are phenomenal! City of bones by Cassandra Clare and Season of the witch by Natasha Moster. A Song for Arbonne by Guy Gavriel Kay. ICED by Moning. I have missed the Fever world! The Hunger Games trilogy and Nation by Terry Pratchett. Best book would be The Fault in our stars! I've been reading Lauren Dane's books - they are all wonderful! The Pledge by Kimberly Derting! Thanks for the giveaway! Thanks so much for this giveaway! The best book I read in 2012 is The Fault in Our Stars by John Green. Such a beautiful, poignant book. Deity by Jennifer L. Armentrout. Oh, there are so many! I read The Monstrumologist, which was the best read of this year :) The characters sucked me in and I loved them so much, which is a bit of a rare thing for me. Loved it! Do look it up if you haven't. I love Insurgent. Thanks for the giveaway! I've read a whole bunch of really awesome books this year. One of my top favorites is The Alchemy of Stone by Ekaterina Sedia - I reeeeally loved it!! I like these kinds of post comment questions, I always find great books to add to my to-read list :) Thanks for the awesome giveaway! I've really liked Obsidian and Onyx by Jennifer L. Armentrout. I never know which book to choose when asked this question. There have been so many amazing books this year that have been added to my favorites list. So, I will go with Silence by Michele Sagara as A fave standalone, and Midnight Dragonfly series by Ellie James. Thanks for the giveaway! wow! there's a lot! But I will always remember every bit and every part of Looking for Alaska and Slammed. SO that would be it. I've read so many good ones! Insurgent, Pandemonium, Sweet Evil, Easy, Beautiful Disaster and the list goes on! Thanks! I really enjoyed Grave Mercy and Crewel. Deadly Obsession by Alexa Grace was AWESOME! Going to go with On Dublin Street! Love that it takes place in Scotland but it is modern day. Hands down, The King Makers by Clay and Susan Griffith. For me this year was Ancheron by Sherrilyn Kenyon, Kiss Of Snow by Nalini singh and Reality Check by Karen Turt. Something Like Normal by Trish Doller. The best book I've read this year is all the werewolves books!! Thanks for the great giveaway! The Immortal Rules, Sweet Evil, Daughter of Smoke and Bone are amongst the best! Gunmetal Magic by Ilona Andrews. The Hunger Games Trilogy. Thanks for the great giveaway! Happy Holidays! Opal by JLA :D Thanks for the giveaway ! The Almond Tree by Michelle Cohen Corasanti. I've really enjoyed A great and terrible beauty trilogy! They are so good! Shadow and Bone by Leigh Bardugo. Thanks for the giveaway! The best book that I read this year would be The Golden Lily - Richelle Mead. Thanks for the chance! Opal by JLA. It was amazing! Either Shadow of Night by Deborah Harkness of City of Dark Magic by Magnus Flyte. I really liked The Raven Boys by Maggie Stiefvater! Thanks for the giveaway!! The best books I have read this year is LUX series by Jennifer Armentrout. This series is awesome!! I have a lot of favorites but I loved City of lost souls by cassandra Clare such a long wait until the next book :( Thank you for the great giveaway! Best romantic love book..by indian author..